Happy Saturday, folks! Welcome back to my second edition of Sub"Herb"an Gardening, also playing triple duty for Heather's Saturday Farmer's Market and Beth Fish Reads Weekend Cooking. Since my first post about our rapidly growing patio garden, everything has exploded! Our sweet banana pepper plant is our biggest success in the patio garden. It has no less than 8 peppers on it right now, and that's pretty much all the time. They're delicious on sandwiches, sauteed on sausage dogs, and sliced on salads. Our bell peppers have been a little disappointing. 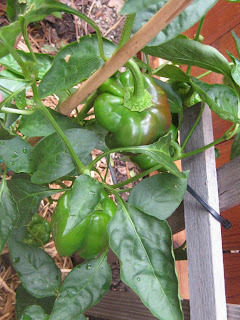 They produce reasonably well, but the peppers never grow bigger than a couple of inches. Perfect for an omelette but not much else. I think the Texas heat is keeping them skinny mini. 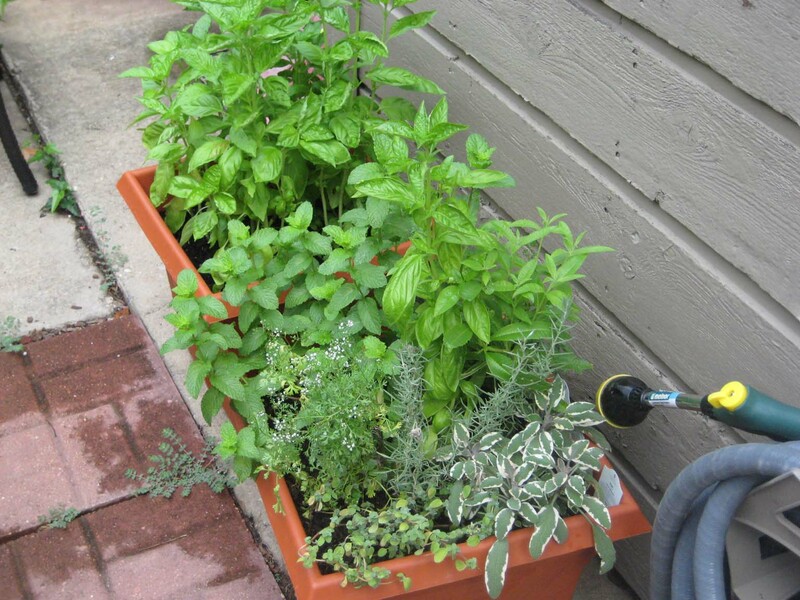 These are our big pots of herbs. 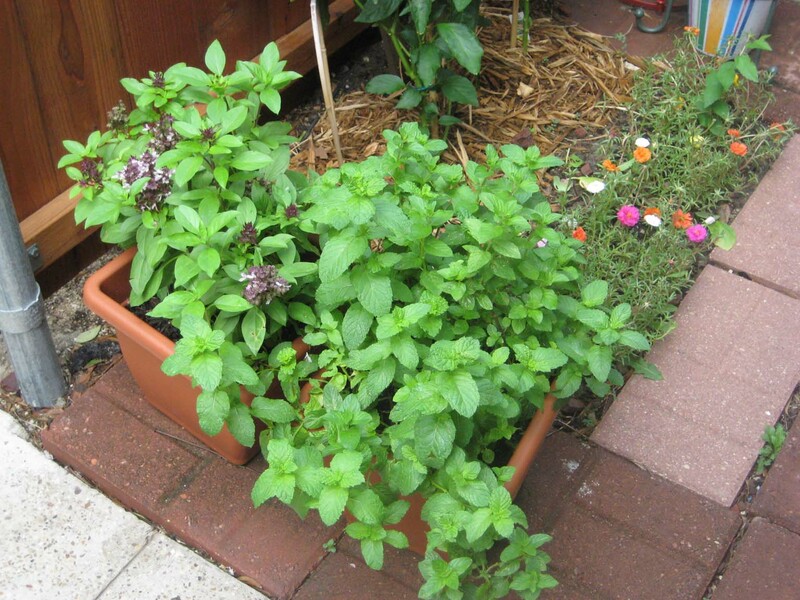 The pot at the top is all basil.The other one is basil, mint, tri-color sage, marjoram, cilantro, oregano, curry, and lemon verbena. 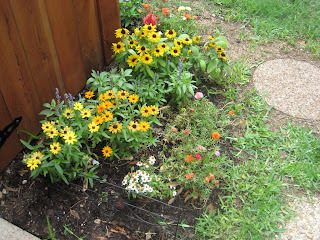 Our flowers: moss roses, zinnias, etc. have gotten even larger than this. I love my lantanas, acorn squash, and lavendar. The final big pots of herbs. Left: thai basi. Right: mint. Thai chili peppers. Pretty AND spicy. So, how does your garden grow? Show me, show me! Your garden looks great! We love peppers around here too. WOW!!!!! Your garden looks absolutely fantastic. I love banana peppers! And your herbs and flowers are so healthy. Way to go!!! I love it!! We love peppers here too! I can't grow anything, it all dies. 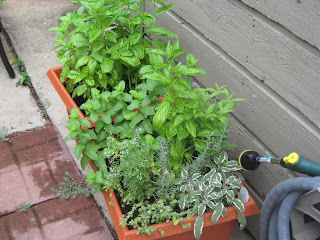 I tried basil once and nothing even sprouted =( Your garden is beautiful! All your plants look great but I love the Thai chili peppers. I'd love some of those. I have one bell pepper plant and so far it's only given me one bell pepper. I guess it's not the year for them. Everything looks so good Andi!!! 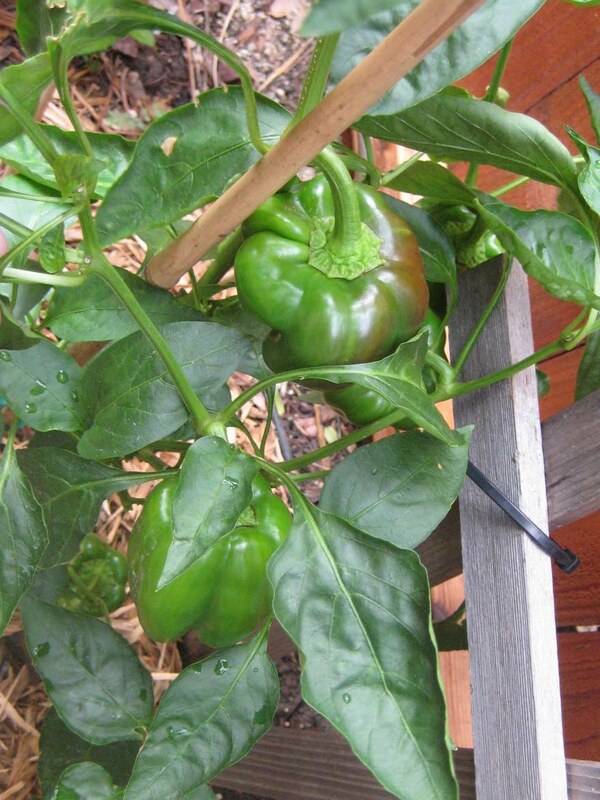 I think your bell peppers look great :D Especially for the heat!! I have one that's growing well so far and it doesn't look near as good as yours :P I'm wondering if it'll keep getting bigger or if the heat will keep it mini size. Love the banana peppers!! Those are so good. And are you actually using the thai peppers to cook with? Or are they just ornamental? I'd love to hear some recipes your making up with them! Your peppers look great! Everything looks so nice. I made jam this week. Hi. 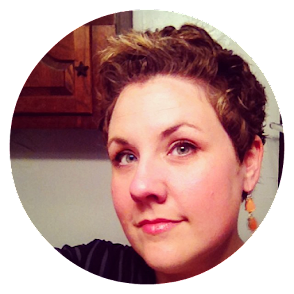 I found you on the blog hop and stopped in to browse. I love your garden pics. I am so envious of anyone who can grow anything. Your herbs are so gorgeous I can almost smell them! I found a couple of titles for my tbr list from your reviews. It looks like we've enjoyed some of the same books. Andi! It all looks so wonderful! I am totally jealous you can get cilantro to grow. I tried it last year and it bolted in like 2 weeks. I was so sad. We love cilantro; the coriander not so much. Hubby would love your banana peppers, he could eat them on everything! There are going to be some tasty dinners coming up at your place! Everything looks tantalizing. Your garden looks great. I want to steal those thai chili peppers! Lost my cilantro to the heat, but let it go to seed, hoping to not have to pay for some next year. Your garden looks wonderful--and yummy! Kathy, same here. We love some peppers and put them in everything. Candace, thanks! 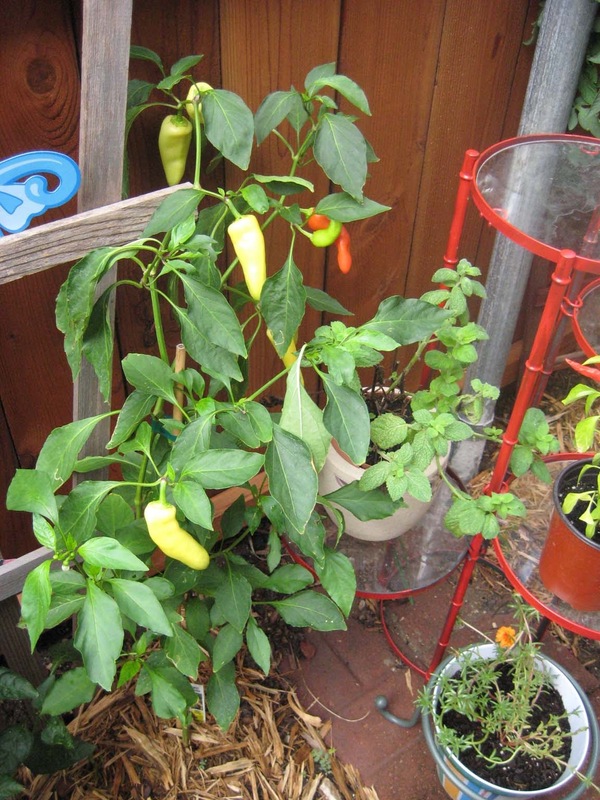 We're wishing that we'd bought two banana pepper plants because if we had a few more we could pickle them. Yum! Kristina, I'm surprised this garden has gone as well as it has so far. I used to think I had a brown thumb, but a little research has helped out a lot. Margot, good luck with your bell peppers. I wish ours would pick up, but it's not looking good. 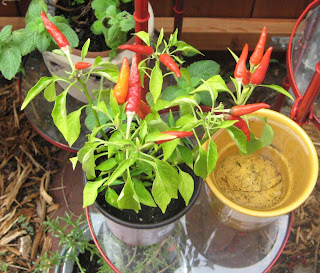 The Thai chilis are looking a little sad compared to their perkiness in that pic. We need to repot them into something bigger so they'll produce more. Chris, the Thai peppers are WICKED hot. We haven't actually used them to cook yet, but I'd love to try something. I'm a huge fan of Hunan chicken, and if I can find a recipe I'll try that. Chris, I saw your jam post...just haven't gotten to comment yet. It looked delicious! Dianne, thanks so much for stopping in. I hopped quite a bit on Friday but didn't get to do as much this weekend as I would've liked. Glad you found some recs here! Heather, I had been doing really good at pinching back the blossoms on the cilantro, but it quickly got away from me. I had to trim it down to the stump a couple of weeks ago because it was DONE. :( I've also killed several dill plants. I think the TX heat was just too much for it. Thanks, Dale! Tasty dinners...check! Haven't seen you in a while, so thanks for stopping by! I'll be getting over to your place, too. Nymeth, yay for pesto! I need to trim my basil back, make pesto, and let it regrow. Chuck might cry, though. He loves the bounty of it. LOL, Caite! I know the feeling. I need to fertilize and trim some things back but it's been too hot for me to actually get out and do it. Thanks, DS! Sorry to hear about your cilantro. Mine got away from me and went to seed, too. Kim, we started out watering ours too much. My recommendation: wait til they're really dry to water them again. 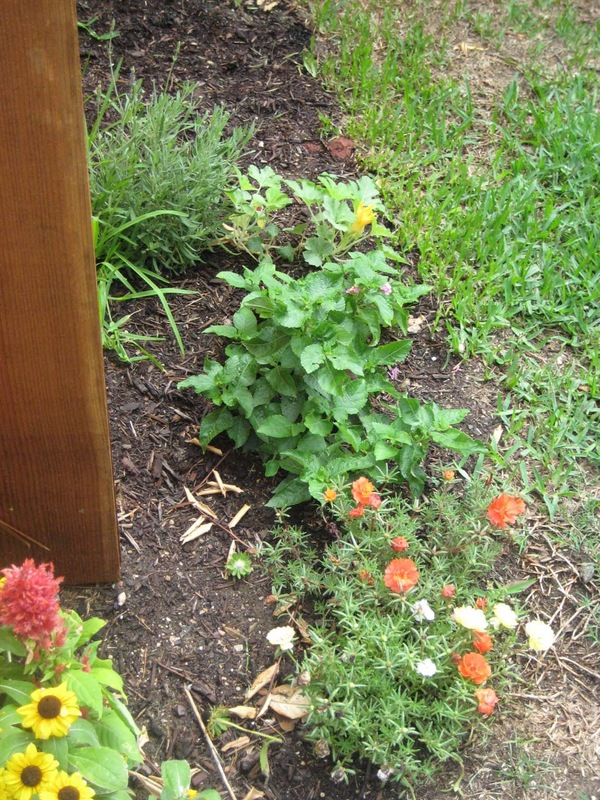 Your herbs look wonderful, Andi! I had lavender last summer, but forgot to plant some this year. I need to keep a journal to remind me of the hits and misses in my garden. The lantana is a definite hit. 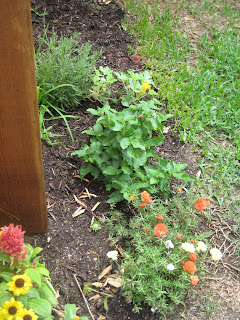 Here's my most recent garden post. I'll get another up next weekend after we return from our vacation. I enjoyed the audio of Venetia Kelly a lot. Your garden looks lovely....jealous! The chilis are excellent and those banana pepers are making me hungry. This year the successful things were a melon plant (no fruit, just flwoers, but that's to be expected in the UK weather), rhubarb begining to grow and irises. Sadly our strawberries just didn't want to grow at all. We have basil, but think we might be using it too much and killing it (love basil).